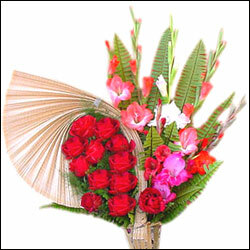 Beautiful Flower Arrangement with Pink Carnation 11, Red Roses 10, White Glades 2 no along with fillers. 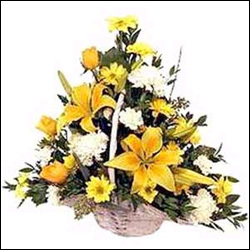 Beautiful flower arrangement basket with Orange Asiatic Lilies and Yellow Carnations. 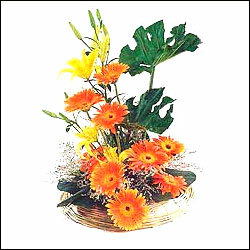 Beautiful flower arrangement basket with Bird of Paradise, Red Gerberas along with Red and Yellow Carnations. 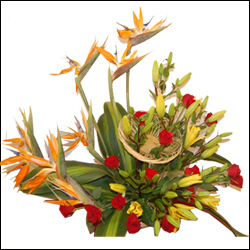 Beautiful flower arrangement with Bird of Paradise, Red anthuriums and Red Carnations. 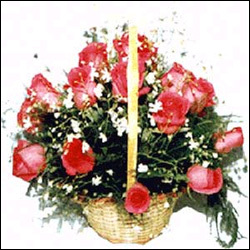 Convey your loving wishes to your dear one by gifting this special arrangement of flower basket with Red and Pink Roses along with White Glades. 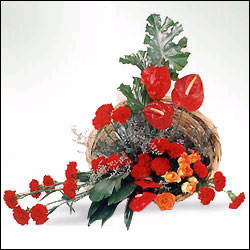 A Charming arrangement of Red and White Carnations is just enough to say special wishes to someone special. 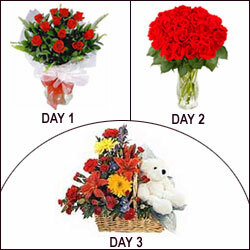 Convey your wishes to your dear one with this beautiful floral arrangement, which fills up immense joy in heart and mind. 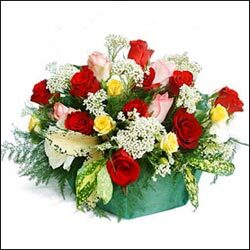 A beautiful way to say, beautiful wishes to beautiful people with this beautiful floral arrangement. 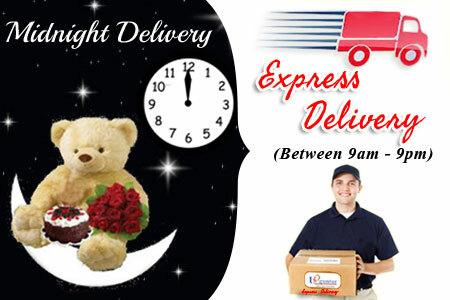 Never delay to convey the feelings to your dear one. Purple Orchids stand for its charm. 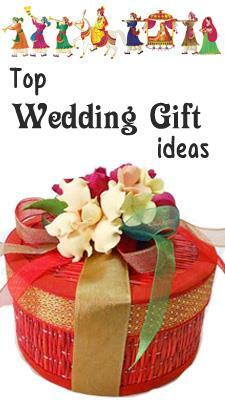 Send this specially arranged basket of 18 Orchids with green fillers to charm her all day long. 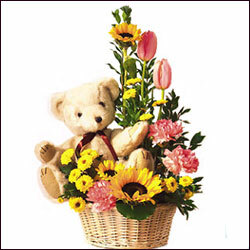 A basket in rich colours with 20 assorted flowers is always welcomed. 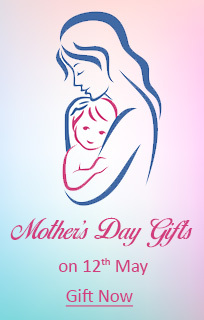 This is an ideal gift for someone you love. Add some glory to their day with this cute 15 dark Pink roses basket. Sure! this will make some difference on their day. 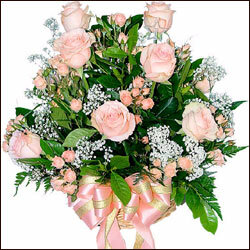 This 24 pink roses arrangement is a perfect gift to send at any time of the year. Brighten up someones day with this classic arrangement. 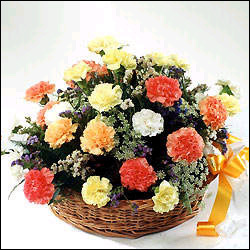 Single Sided Arrangement of 25 Dutch Roses along with crisp greens in an exotic wicker basket. 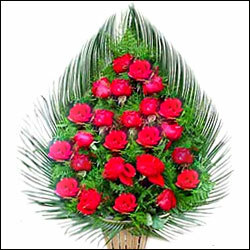 This sweet and feminine 25 Red Roses arrangement along with crisp greens in an exotic wicker basket makes your presence felt. 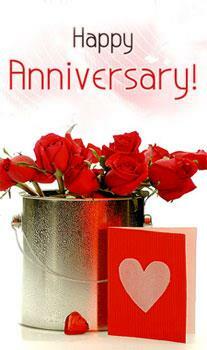 + Free Anniversary Greeting Card + Free Digital Photo. 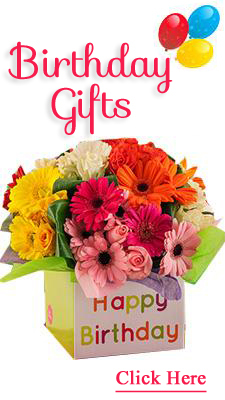 This extravagant display consists of 12 Gerberas, Daisies and Asters + Free Anniversary Greeting Card + Free Digital Photo. 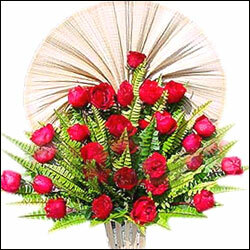 A classic collection of 12 stunning roses along with delicate floral accents and crisp greens in an exotic wicker basket makes your dear one feel your tender touch on their eventful occasion. 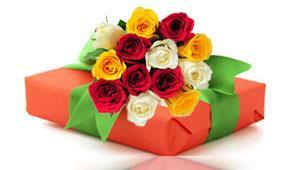 20 Red roses classically arranged in a basket, is sure to creat a passion in your lover's delicate heart towards you. 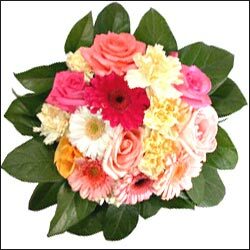 Send this lovely arrangement of 12 pink flowers to someone you love very much.